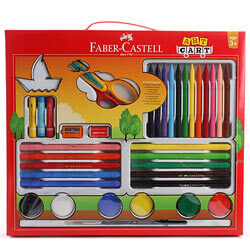 Create magical moments by ordering online this Wonderful Faber Castell Art Cart Gift Set for Kids for your loved ones and spread your warm feelings into their hearts. This Gift Set contains Dry N Wet Assorted Colours and Accessories such as 12 Erasable Crayons, 3 Oil Pastels, 10 Water Colour Pens, 6 Tempera Colour, 1 Paint Brush, 1 Scratch Tool, 1 PVC Free Eraser, 1 Rust Free Sharpener and 1 Craft Scissors. Paper Door Tag is included inside the Pack. Flowers Delivery Trivandrum, Send sweets Tirumala, Wedding Cake Hapur, Diwali Mithai Hanamkonda, Send Flowers and Gifts to Sivakashi, Online Shop Taran Taran, Flower to Rohtak, New Year Flowers Ujjain , Fresh Fruits Bhilwara, Send Gift Jaisalmer, Dry Fruits to Chittorgarh, Birthday Delivery Ujjain, Sending to Ghaziabad, Flower shop Sambhalpur, Virudhunagar Online Cake Delivery.